This is going to be a very brief recap! 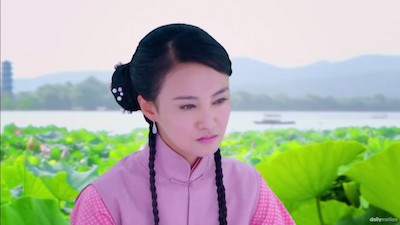 We go full circle yet again with Shao Tian’s lies – Cai Hong goes back and forth believing him, and this is going to just be very concise because nothing significant really happens. I’m really hoping in the next few episodes something actually changes and picks up. I’m attached to Jiang Yu’s character so I’m not bored anymore, but the laggy plotline is really irritating right now. Ever since finding out that Shao Tian is a liar, Cai Hong has been out of it. 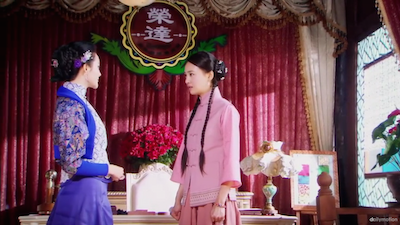 Jiang Yu finds her zoning out again while her soup was boiling, and Cai Hong ends up boiling her hand. AHHH and this scene where Jiang Yu gently tries to help her calm her burnt hand through the cold water. So sweet. I hope they get together soon for the sake of Jiang Yu because he is just so adorable. While Jiang Yu is out, Cai Hong begs Fei Fei for a day off. Meanwhile, Jiang Yu goes to a telegrapher and sends out a message to a pen manufacturer and distributer that sold him the gold pen. Jiang Yu is certain that Shao Tian has the same pen. So he sends a message to the pen distributer of the golden pen asking about its warranty, and signs off with Shao Tian’s name. Meanwhile, Cai Hong is out at Lu Man’s, trying to figure out if Shao Tian lied. Cai Hong obviously does not have any investigative skills at all though, because she asked such easy leading questions to Lu Man, that it made it extra easy to lie to her. 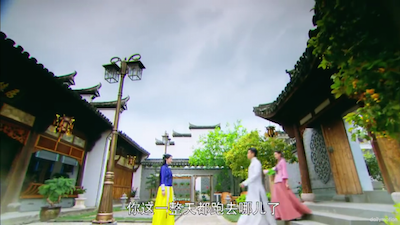 Lu Man agreed that Shao Tian was sent to do a dangerous mission in order to have the money to pay for her mansion, and Cai Hong was distraught. 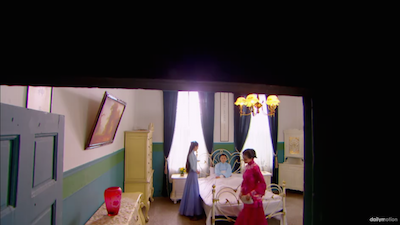 Cai Hong goes to Shao Tian’s mom to stop Shao Tian from going, but he had already left for his mission. 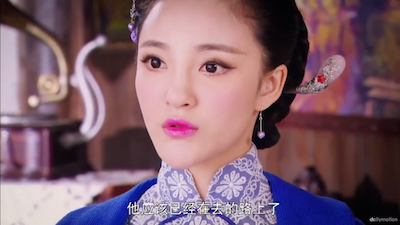 Feeling guilty, and trusting Shao Tian completely again, she is worried sick about his safety. Shao Tian is actually on a dangerous mission too – which surprised me. 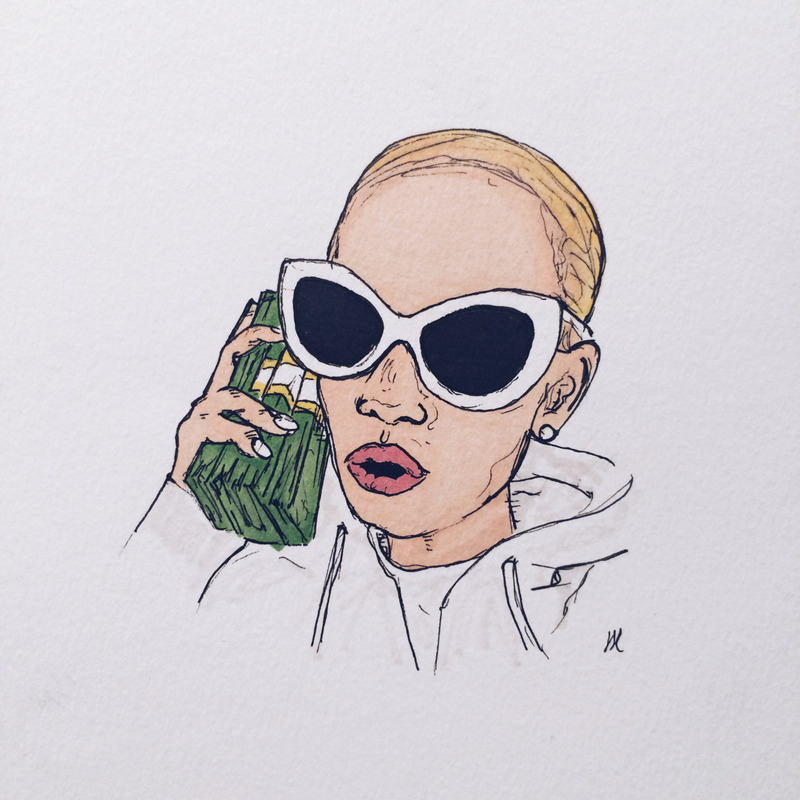 I thought he was actually lying to her again, but I guess Lu Man really did give him all that money just to put his life on the line. His dangerous mission was to deliver fabrics to the frontline of the war. On his way back he received serious injuries on his hand. 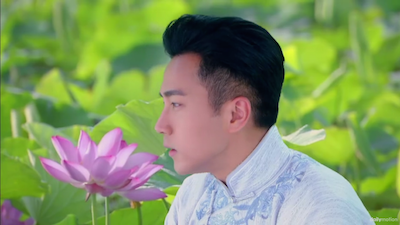 It is insinuated in the drama that Lu Man has a crush/likes Shao Tian, probably because of his devotion to Cai Hong. I really hope Shao Tian and Lu Man can get together because I really want Shao Tian out of the picture -_-. Lu Man finds out that Shao Tian is hurt, and in the hospital, and rushes to see him. She also notifies Cai Hong of his injury. Cai Hong rushes to see Shao Tian in the hospital and promises to never doubt him again. Shao Tian asks her to deliver him home as his injuries are well enough now. 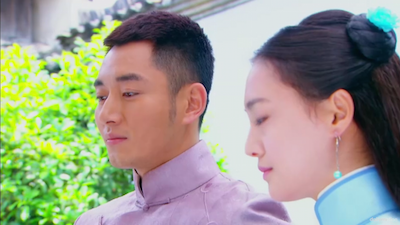 At home, in front of his mom, Cai Hong agrees to marry Shao Tian (Oh girl you do not know what you’re getting into). 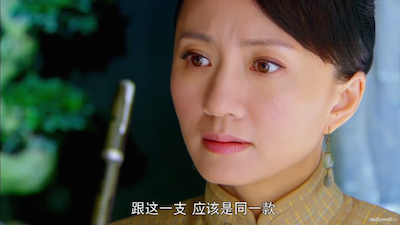 Jiang Yu receives a letter back from the pen manufacturer that confirms that Shao Tian had indeed purchased the same golden pen before the murder. He tells Cai Hong of this fact, and they both look for him at his house. Shao Tian was out on a trip, and he wasn’t home. 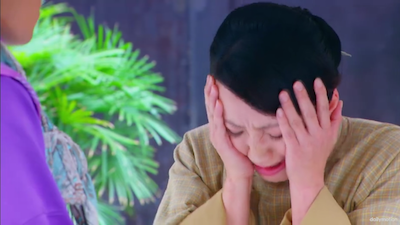 Instead, Cai Hong and Jiang Yu asked Shao Tian’s mom whether she’s seen that pen before, and she confirmed that she had seen it on the day of Wu Hong Da’s death. 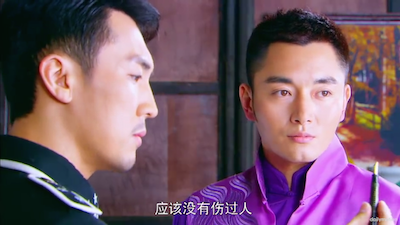 Cai Hong and Jiang Yu immediately notify the police of this fact, and they start looking to arrest/question Shao Tian. Lu Man, who seems to be in love with Shao Tian, finds out about this. She immediately notifies Shao Tian (who is out of town for a trip) to stay out for a while, until she figures out a way to get him out of this mess. After finding out about Shao Tian’s ownership of the exact model of pen that had also injured her father, Cai Hong was understandably upset for a few days. 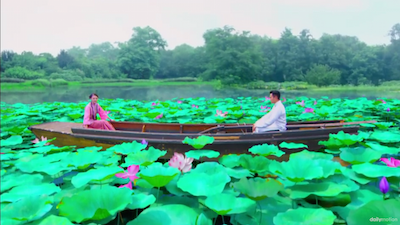 So Jiang Yu decided to take her out on a boat ride in a river of very-fake-looking lotus flowers. 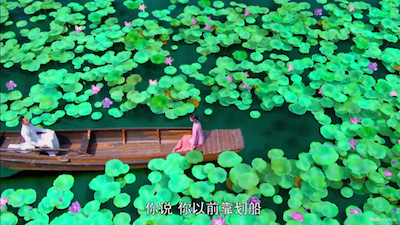 The fake CGI level of these flowers are out of this world. 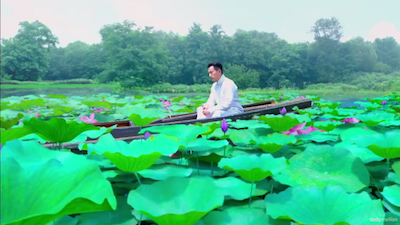 Jiang Yu steers the boat and rows them into the lotus leaves. Cai Hong asks how he knew how to manoeuvre a boat (since he’s just a wealthy guy) and he surprised her by saying that he used to have to do this for a living. 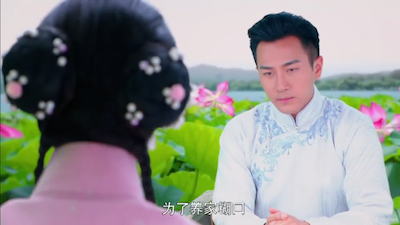 Finally, Jiang Yu opens up to her (amongst the very fake flowers, no less) and tells her that when he was young, his father was wrongly accused and killed by a ‘bad man’. This ‘bad man’ ruined his life because in one night, he lost his father and he lost the company and the house because it was confiscated as well. Cai Hong asked if he gotten revenge on the ‘bad man’ yet, not knowing that it’s her dad. 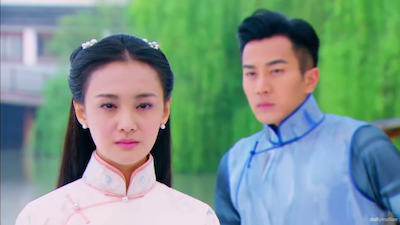 He sweetly looks at her and explains that vengeance and hate cannot end with more vengeance and hate, and sometimes good things come out of the bad, like how the dirty soil underneath could sprout such beautiful pure flowers (an analogy for Cai Hong). 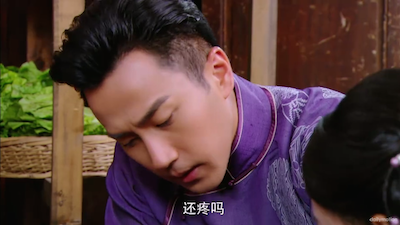 Jiang Yu goes home with Cai Hong and Fei Fei confronts him. Fei Fei has been dealing with an important customer of Ling Long while Jiang Yu has been out having fun with ‘a servant’. I feel so bad for Fei Fei – she puts in so much work and she’s picking up so much of the slack just so Jiang Yu can have his ‘alone time’ with Cai Hong. Even if she didn’t have a crush on him, it’s unfair to her how he’s neglecting his responsibilities to be with Cai Hong. Lu Man finds an excuse to go to Shao Tian’s house, and manages to sneak a pen into his room. She then sends a message to him to come back. Shao Tian finally comes back and his mother confronts him about the murder charges – and asks him if he killed Wu Hong Da because of what happened to his father. 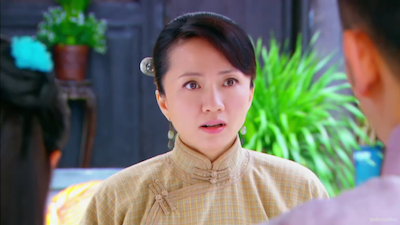 Shao Tian’s mom is very vague with this so we don’t know exactly what Wu Hong Da did to his family, but Shao Tian denies it (even though the drama implies that there is some truth to that statement). Before long, the police arrive to his house (along with Cai Hong and Jiang Yu). They confront him with having the exact same pen – this makes him the most suspicious as Wu Hong Da showed to have wounds from a gold pen. Shao Tian calmly reveals a gold pen (that Lu Man had planted earlier) and said that it was ordered for Cai Hong to give to her dad for his birthday, but he never brought it out because he was afraid that it would upset Cai Hong. Showing a completely undamaged pen (as the pen that would have wounded Wu Hong Da would’ve been mutilated), Shao Tian rids himself of suspicion. 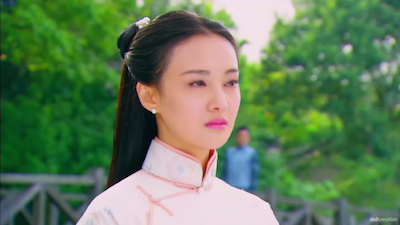 On the way back, the gullible Cai Hong begins to doubt herself once again, and starts to believe Shao Tian’s lies. OK if she still starts to believe him in the next episode, and we go full circle again, I am going to flip a table. No, I will flip TABLES. I hope this plot starts moving faster! BTW Hawick and Zheng Shuang are filming another drama right now together – Hawick is Kang Xi, and Zheng Shuang is one of his consorts. 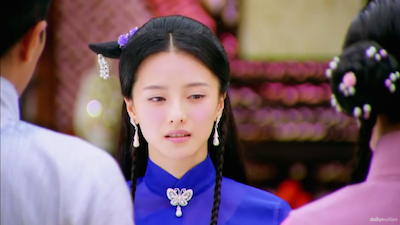 I really hope that Zheng Shuang doesn’t ruin that one as well. Omfg I’m sorry to rant here Deer, but wtf episode 20 I skim through it ands she’s still asking Jiang Yu if he killed her dad! Omfg I swear it’s just going around in circles. omg I actually read your comment before I watched and I sighed – at least you prepared me for the disappointment for episode 20… because I thought we were actually going somewhere with this drama, but turns out that this female lead is too dumb to start piecing things together..